These potatoes are a staple in our home. Whether accompanying roast lamb or chicken, or just on their own, we have them a couple of times a week. They are delicious and the ones that get overly-brown in the pan and stick a bit are MINE! Preheat oven to 420°F A reviewer has suggested spraying the baking pan with Pam - that sounds like a great idea! Put all the ingredients into a baking pan large enough to hold them. Season generously with sea salt and black pepper. Make sure your hands are very clean and put them in the pan and give everything a toss to distribute. The garlic will drop into the water/oil solution but its flavour will permeate the potatoes, and this way, it won't burn. 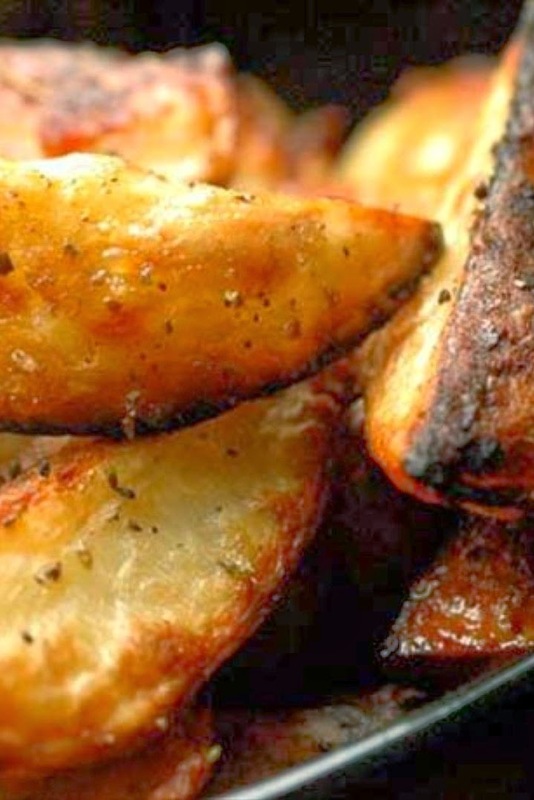 When a nice golden-brown crust has formed on the potatoes, give them a stir to bring the white underside up, season lightly with a bit more sea salt and pepper and just a light sprinkling of oregano. Add 1/2 cup more water if pan appears to be getting dry, and pop back into oven to brown other side of potatoes. This will take about another 40 minutes. Do not be afraid of overcooking the potatoes- they will be delicious. Note: I often melt a bouillon cube in the water; if you do, make sure to cut back some on the salt.